Yesterday night, it was decided to have spaghetti & meatballs for dinner. 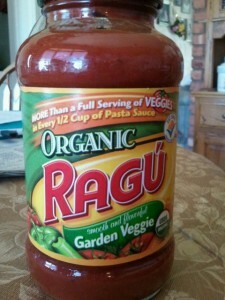 I cooked up myself some whole wheat spaghetti, vegetarian style meat balls, and this Organic Ragu Garden Veggie Pasta Sauce to have. I don’t always buy organic, but whenever I can, I like to! The nutritional facts were pretty good. For a half cup serving, there was 2.5 grams of fat and 80 calories. The sodium level was a tad high, at 480 mg, and the sugar content was a bit high as well, at 8 grams. 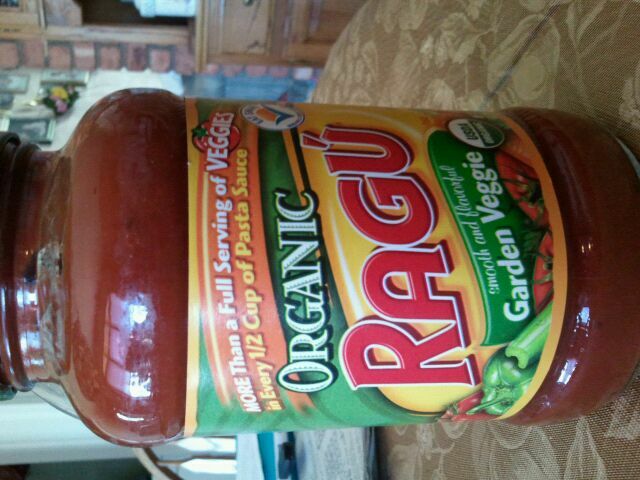 However, on the front of the jar, it says that there is “MORE Than a Full Serving of VEGGIES in Every 1/2 Cup of Pasta Sauce”, so that was something I certainly liked. I cooked it in a small saucepan on the stove, separate from any thing else, as I didn’t want to effect the taste. I noticed it wasn’t super thick, but not overly liquidy either. It actually had a nice consistency to it. It was certainly a sweeter sauce, but wonderfully spiced, with a bit of parsley flavor. It was also a bit salty, but I feel as if most pasta sauces are. What’s your favorite thing to put on pasta? I like mine with sauce, veggies, and some parmesan cheese! 1/2 cup is 80 calories, 2.5 grams of fat, 12 grams of carbohydrates, 2 grams of fiber, 8 grams of sugar and 2 grams of protein.